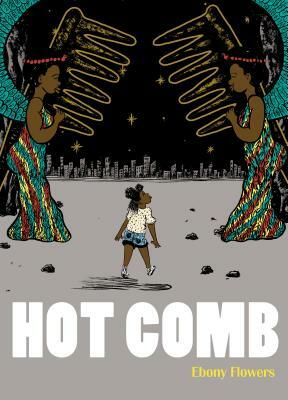 Hot Comb offers a poignant glimpse into black women’s lives and coming-of-age stories as seen across a crowded, ammonia-scented hair salon while ladies gossip and bond over the burn. The titular “Hot Comb” is about a young girl’s first perm—a doomed ploy to look cool and stop seeming “too white” in the all-black neighborhood her family has just moved into. In “Virgin Hair,” taunts of “tender-headed” sting as much as the perm itself. “My Lil Sister Lena” shows the stress of being the only black player on a white softball team. Lena’s hair is the team curio, an object to be touched, a subject to be discussed and debated at the will of her teammates, leading Lena to develop an anxiety disorder of pulling her own hair out. Throughout Hot Comb, Ebony Flowers re-creates classic magazine ads idealizing women’s need for hair relaxers and products. “Change your hair form to fit your life form” and “Kinks and Koils Forever” call customers from the page. Realizations about race, class, and the imperfections of identity swirl through these stories and ads, which are by turns sweet, insightful, and heartbreaking. Flowers began drawing comics while earning her Ph.D., and her early mastery of sequential storytelling is nothing short of sublime. Hot Comb is a propitious display of talent from a new cartoonist who has already made her mark. Ebony Flowers is a cartoonist and ethnographer specializing in qualitative research and evaluation, picture-based methods, curriculum studies, and STEAM education. She began drawing comics while earning her Ph.D. in curriculum and instruction from the University of Wisconsin–Madison.